, a Benedictine of the congregation of St. Maur, and one of the most learned antiquaries France has produced, was born Jan. 17, 1655, at Soulage in Langnedoc, whither his parents had removed on some business; and was educated at the castle of Roquetaillade in the diocese of Alet, where they ordinarily resided. His family was originally of Gascony, and of the ancient lords of Montfaucon-le-Vieux, first barons of the comte de Comminges. The pedigree of a man of learning is not of much importance, but Montfaucon was an antiquary, and has given us his genealogy in his “Bibl. Bibliothecarum manuscriptorum,” and it must not, therefore, be | forgotten, that besides his honourable ancestors of the thirteenth and fourteenth centuries, he was the son of Timoleon de Montfaucon, lord of Roquetaillacle and Conillac in the diocrse of Alet, by Flora de Maignan, daughter of the baron d’Albieres. He was the second of four brothers. From his early studies in his father’s house he was removed to Limoux, where he continued them under the fathers of the Christian doctrine, and it is said that the reading of Plutarch’s Lives inspired him first with a love for history and criticism. 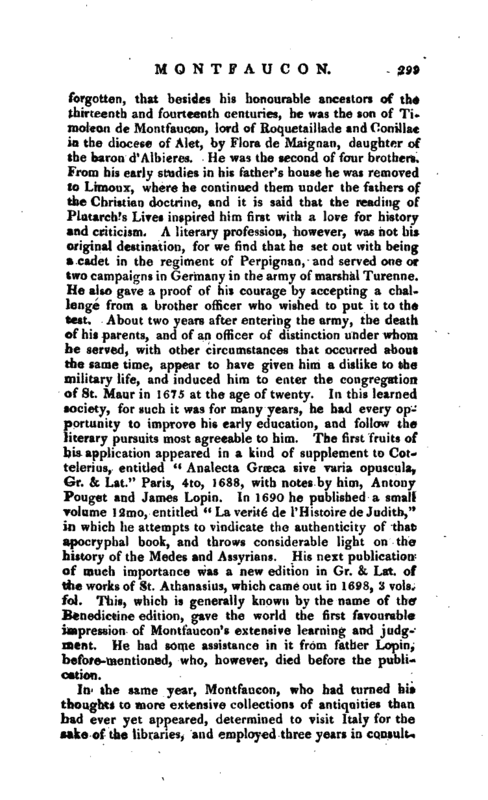 A literary profession, however, was not his original destination, for we find that he set out with being a cadet in the regiment of Perpignan, and served one or two campaigns in Germany in the army of marshal Turenne. He also gave a proof of his courage by accepting a challenge from a brother bfficer who wished to put it to the tfcst. About two years after entering the army, the death of his parents, and of an officer of distinction under whom he served, with other circumstances that occurred about the same time, appear to have given him a dislike to the military life, and induced him to enter the congregation of St. Maur in 1675 at the age of twenty. In this learned society, for such it was for many years, he had every opportunity to improve his early education, and follow the literary pursuits most agreeable to him. The first fruits of his application appeared in a kind of supplement to Cottelerius, entitled “Analecta Graeca sive vuria opuscula, Gr. & Lat.” Paris, 4to, 1688, with notes by him, Antony Pouget and James Lopin. In 1690 he published a small volume 12mo, entitled “La verite de l’Histoire de Judith,” in which he attempts to vindicate the authenticity of that apocryphal book, and throws considerable light on the history of the Medes and Assyrians. His next publication of much importance was a new edition in Gr. & Lat. of the works of St. Athanasius, which came out in 1698, 3 vols. fol. This, which is generally known by the name of the Benedictine edition, gave the world the first favourable impression of Montfaucon’s extensive learning and judgment. He had some assistance in it from father Lopin, before-mentioned, who, however, died before the publication. In the same year, Montfaucon, who had turned his thoughts to more extensive collections of antiquities than had ever yet appeared, determined to visit Italy for the sake of the libraries, and employed three years in | consulting their manuscript treasures. After his return, he published in 1702, an account of his journey and researches, under the title of “Diarium Italicum, sive monumentum veterum, bibliothecarum, musitorum, &c. notitias singulares, itinerario Itaiico collects; additis schematibus et figuris,” Paris, 4to. Of this an English translation was published in 1725, folio, by as great a curiosity as any that father Montfaticon had met with in his travels, the famous orator Henley, who had not, however, at that time disgraced his character and profession. 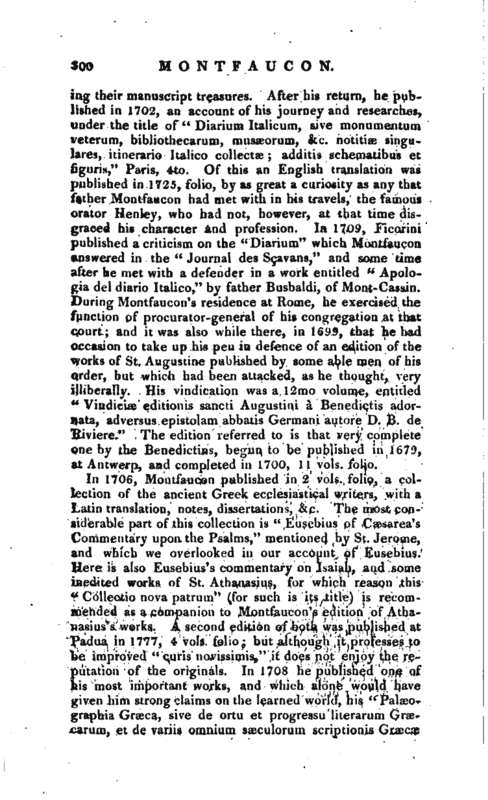 In 1709, Ficorini published a criticism on the “Diarium” which Montfaucon answered in the “Journal des Scavans,” and some time after he met with a defender in a work entitled “Apologia del diario Itaiico,” by father Busbaldi, of Mont-Cassin. During Montfau con’s residence at Rome, he exercised the function of procurator-general of his congregation at that court; and it was also while there, in 1699, that he had occasion to take up his pen in defence of an edition of the works of St. Augustine published by some able men of his order, but which had been attacked, as he thought, very illiberally. His vindication was a 12mo volume, entitled “Vindiciae editionis sancti Augustiui a Benedictis adornata, adversus epistolam abbatis Germani autore D. B. de Hiviere.” The edition referred to is that very complete one by the Benedictions, begun to be published in 1679, at Antwerp, and completed in 1700,11 vols. folio. 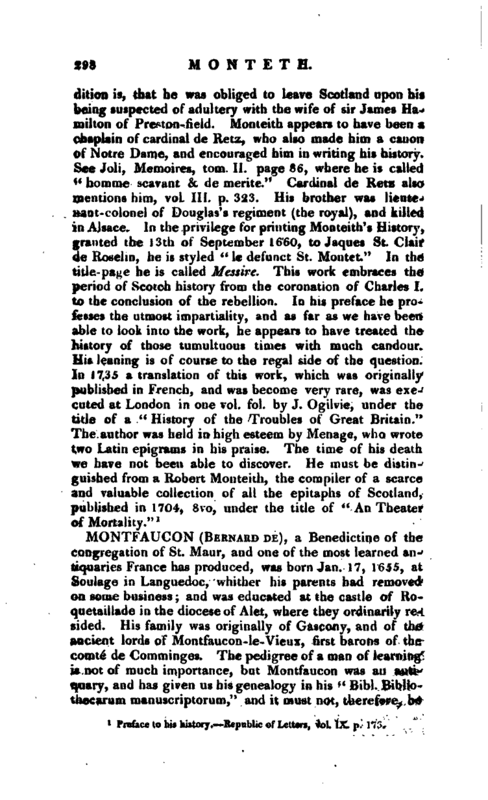 In 1706, Montfaucon published in 2 vols. folio, a collection of the ancient Greek ecclesiastical writers, with a Latin translation, notes, dissertations, &c. The most considerable part of this collection is “Eusebius of Caesarea’s Commentary upon the Psalms,” mentioned by St. Jerome, and which we overlooked in our account of Eusebius. Here is also Eusebius’s commentary on Isaiah, and some inedited works of St. Athanasius, for which reason this ic Collectio nova patrum“(for such is its title) is recommended as a companion to Montfaucon’s edition of Athanasius’s works. A second edition of both was published at Padua in 1777, 4 vols. folio; but although it professes to be improved” curis novissimis,“it does not enjoy the reputation of the originals. In 1708 he published one of his most important works, and which alone would have given him strong claims on the learned world, his” PaltEOgraphia Graeca, sive de ortu et progressu literarum Graecarum, et devariis omnium sasculorum scriptionis Graecye | generibus; itemque de abbreviationibus et notis variarum artiam et disciplinarum. Additis figuris et schematibus ad fidem manuscriptorum codicum,“folio. This invaluable work has done the same in reference to the discovery of the age of Greek Mss. which the” De re diploir.atica" of Mabillon has done to ascertain the age of those in Latin. At the end of this work, are John Comnenus’s description of Mount Athos, Gr. and Lat. with a learned preface; and a dissertation by the president Bouhier on the ancient Greek and Latin letters. 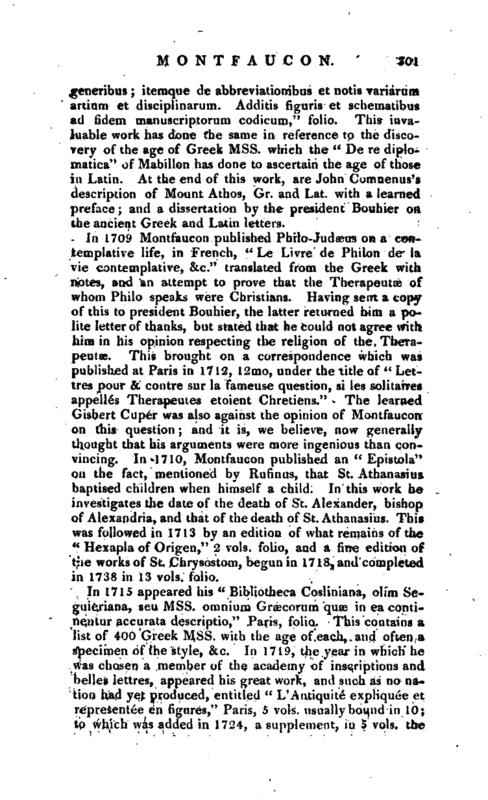 In 1709 Montfaucon published Philo-Juda&us an a contemplative life, in French, “Le Livre de Philon de la vie contemplative, &c.” translated from the Greek with notes, and an attempt to prove that the Therapeutee of whom Philo- speaks were Christians. 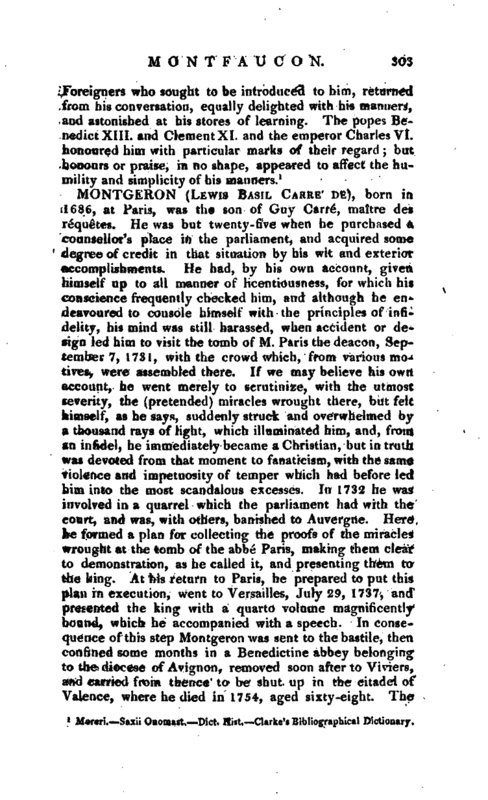 Having sent a copy of this to president Bouhier, the latter returned him a polite letter of thanks, but stated that he could not agree with, him in his opinion respecting the religion of the Therapeutse. This brought on a correspondence which was published at Paris in 17 12, 12mo, under the title of “Lettres pour & contre sur la fameuse question, si les solitaires appelles Therapeutes etoient Chretiens.” The learned Gisbert Cuper was also against the opinion of Montfaucon on this question; and it is, we believe, now generally thought that his arguments were more ingenious than convincing. In 1710^ Montfaucon published an “Epistola” on the fact, mentioned by Rufinus, that St. Athanasius baptised children when himself a child. In this work he investigates the date of the death of St. Alexander, bishop of Alexandria, and that of the death of St. Athanasius. This was followed in 1713 by an edition of what remains of the “Hexapla of Origen,” 2 vols. folio, and a fine edition of the works of St. Chrysostom, begun in 1718, and completed in 1738 in 13 vols. folio. In 1715 appeared his “Bibliotheca Cosliniana, olim Seguieriana, seu Mss. omnium Graecorum quae in ea conjinentur accurata descriptio,” Paris, folio. This contains a list of 400 Greek Mss. with the age of each, and often a specimen of the style, &c. In 1719, the year in which he was chosen a member of the academy of inscriptions and belles lettres, appeared his great work, and such as no nation had yet produced, entitled “L’Antiquite expliquee et representee en figures,” Paris, 5 vols. usually bound in 10; to which wa, added in 1724, a supplement, in 5 vob. the | whole illustrated by a vast number of elegant, accurate, and expensive engravings, representing nearly 40,000 objects of antiquity, engraved from statues, medals, &c. in the various cabinets of Europe. In such a vast collection as this, it is as unnecessary to add that there are many errors, as it would be unjust to censure them with all the parade of criticism. In the case of a work which so many hundred recent scholars and antiquaries have quoted, and which laid the foundation for the improvements of later times, it would be fastidious to withhold the praises so justly due to the laborious author. Whole societies, indeed, would think much of their joint efforts, if they had accomplished a similar undertaking. It remains to be noticed, however, that the first edition of the above dates, is the most valuable. That reprinted in 1722 with the supplement of 1757 is by no means of equal reputation. Some copies made up from the edition in 10 vols. of 1719, and the supplement of 1757, are also in little esteem. This was followed by another interesting work, which is now become scarce, “Les Monumens de la monarchic Francoise, avec les fig. de chaque regne, que Pinjure du temps a epargnees,” Paris, 1729 1733, 5 vols. folio. This collection, of which he published a prospectus in 1725, may be properly called “The Antiquities of France,” and includes all those classes, civil, ecclesiastical, warlike, manners, &c. which form a work of that title in modern language. His last, and not the least important of his works, was published in 1739, 2 vols. folio, under the title of “Bibliotheca bibliothecarum Mss. nova, ubi quae innumeris pcene manuscriptorum bibliothecis continentur ad quod vis litteraturx genus spectantia et notatu digna, describuntur, et indicantur.” Two years after the learned author died suddenly at the abbey of St. Germain des Pres, Dec. 21, 1741, at the advanced age of eighty-seven. Besides the works above mentioned, Montfaucon contributed many curious and valuable essays on subjects of antiquity, &c. to the memoirs of the academy of inscriptions and belles lettres, and other literary journals. Moreri, Saxii Oaomast, —Dict. Hist. 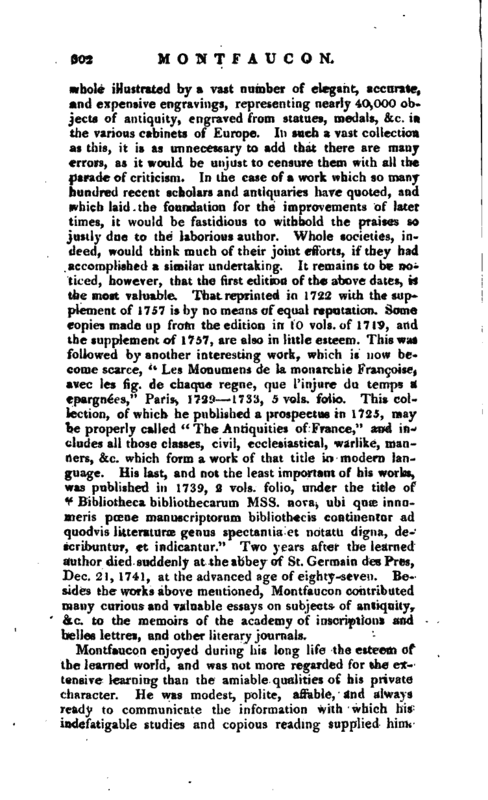 Clarke’s Bibliographical Dictionary.